Happy Friday! This card will be my make-n-take for the Janesville meeting tomorrow. It's called a Joy Fold Card and you can find a complete tutorial here. I wanted to use a new set and a SAB set. I though the Cheep Talk set worked perfectly with the Rainbow Sherbet dsp. It looks so springy! I also used the Congrats SAB set. 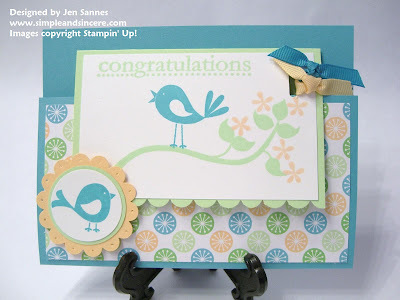 I like this set because it is perfect to use when you want to add a sentiment to the inside of your card. I'm looking forward to a busy weekend of stamping! I can't wait for our meeting tomorrow. I'm sure I will come back with all kinds of great trades and new ideas! See you on Monday! love your card. will have to case!